In The Secrets of Happy Families, New York Times bestselling author Bruce Feiler has drawn up a blueprint for modern families — a new approach to family dynamics, inspired by cutting-edge techniques gathered from experts in the disciplines of science, business, sports, and the military. 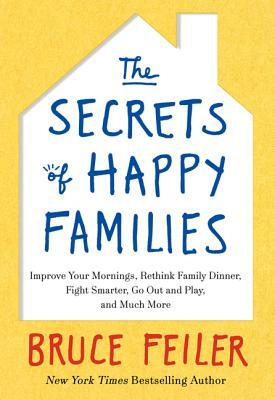 Timely, compassionate, and filled with practical tips and wise advice, Bruce Feiler’s The Secrets of Happy Families: Improve Your Mornings, Rethink Family Dinner, Fight Smarter, Go Out and Play, and Much More should be required reading for all parents. Bruce Feiler is the author of six consecutive New York Times bestsellers, including Abraham, Where God Was Born, America's Prophet, The Council of Dads, and The Secrets of Happy Families. He is a columnist for the New York Times, a popular lecturer, and a frequent commentator on radio and television. He lives in Brooklyn with his wife and twin daughters. “A self-help book with teeth, loaded with examples. ... The Secrets of Happy Families is comprehensive and clear, a how-to guide for dads who may not have realized they needed one.